Chabad of Orange-Woodbridge will hold a talk by New York Times Best-selling author Neal Bascomb at 7:30 p.m. Dec. 1 at 261 Derby Ave.
Bascomb will tell the story behind the capture of the notorious Nazi Adolf Eichmann, according to a release. The net proceeds of the event will benefit the rebuilding of the Hebrew Congregation of Woodmont in Milford, the release said. "The adage that truth is stranger than fiction applies to this extraordinary narrative," the release said. "Bascomb uses the actual accounts of the 'Nazi Hunters' who were there and who lived every moment of this amazing drama." "From the planning stages to the final momentous climax, you will be mesmerized by the detail and historical significance of the unfolding events. 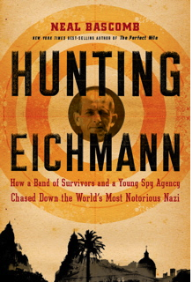 Bascomb offers a riveting account of the operation to capture Adolph Eichmann, the architect of the mass murder of Europe’s Jews, and the effort to bring him to trial," the release said. General admission is $10, students $5, and an evening sponsor will be $180 which includes cocktails and conversation with the author before the talk at 6:30 p.m.